With a little practice, the Multimac can be fitted or removed from your car in just two minutes. How does it fit in the car? How does it work for all child groups? Can I use one Multimac in 2 cars? Can I use my Multimac in my new car when I change it? What do I have to take out of my old car before I sell it? The dividers between the individual seats look very narrow. Is this OK? What is the difference in capacity of the different Multimac widths? Will Multimac fit in the front seat of the car? My car has side air bags in the rear. Is this a problem? Why is Multimac so expensive? Would you use one for your children? Yes: It has been tested and approved to the latest European Standard ECE 44-04 where its results were dramatically better than the specified requirements. As the first multiple child seat, it has probably been subjected to more scrutiny than any child seat in history, including BSI, TRL, VCA, British government, European government, Swedish Road Administration and VTI. The Insurance Companies have been notified that it will be available, and have given their approval, acknowledging that it does actually increase the number of passengers carried in a car, and welcoming its contribution to enhanced child safety. You do however have to notify your insurer that you are using a Multimac: you will then be covered in any eventuality, and if your Multimac is stolen, or damaged in an accident, it will be replaced. Britain’s largest Insurer has actually positively endorsed it. 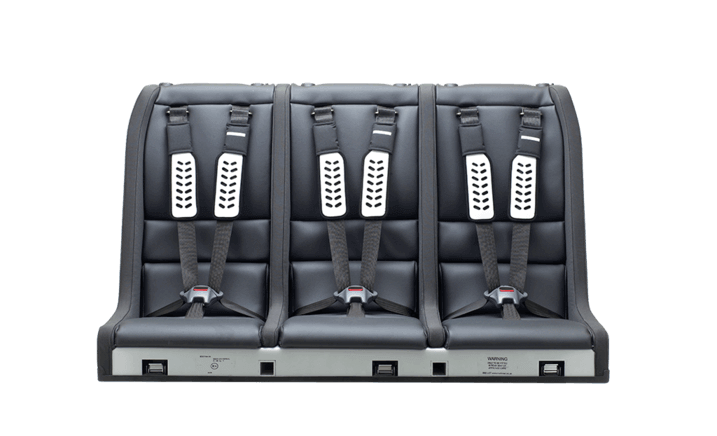 It is secured into the car by two Tether Straps which bolt permanently onto the central adult seat belt fixings, and two integral, adjustable, legs which rest on the car floor. Once the Tether Straps have been initially fitted, the Multimac can be fitted or removed in about a minute. and has been crash tested in11 different combinations of numbers/ages of children to cover all worst-case loading scenarios. Yes. The fitting list shows the widest Multimac model which will fit each car, so provided you select the smaller size which will fit your smaller car, it will also fit your larger car. For each Multimac ordered, we provide a ‘fitting kit’ [Tether strap and appropriate eye-bolts, and replacement Adult buckles if necessary], so you will have to specify 2 fitting kits for your nominated cars. Yes, provided you check the fitting list and ensure that your new car is no narrower than your original [i.e. the same size Multimac will fit]. You will have to order a new fitting kit for the new car. Just the Tether Straps. The eye-bolts can be left in place. As described in question 2: the accessories provide whatever support is required for each age/size range, and you will note a big overlap between the size ranges to suit different countries: for example, children in Sweden have to fit rear-facing until they are 15kg, whereas in UK they can [though not recommended] fit forward facing from 9kg. The MINIMAC will accommodate children up to 15kg, and the YLVA headrest can accommodate children from 9kg, both giving the necessary side impact protection. As legislation changes, or if customers demand it, any desired range of other attachments can be made available, to fit quickly in the secure mountings of the Multimac frame. 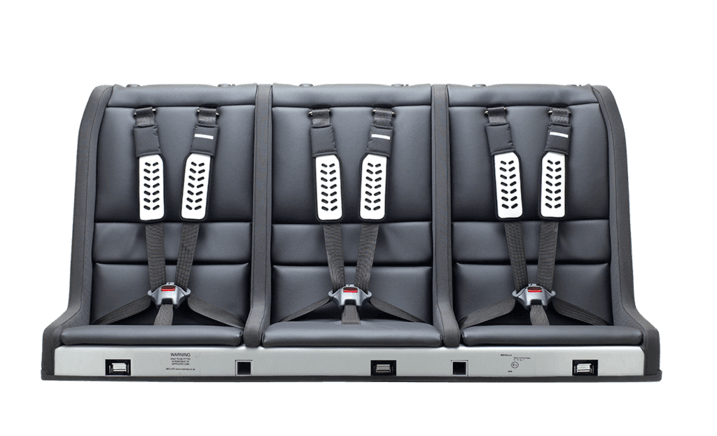 Note that the Multimac has an integral 5-point harness, giving significant lateral support to children of all ages. Alternative booster types for larger children rely on the adult 3-point belt, which children can slip out of. 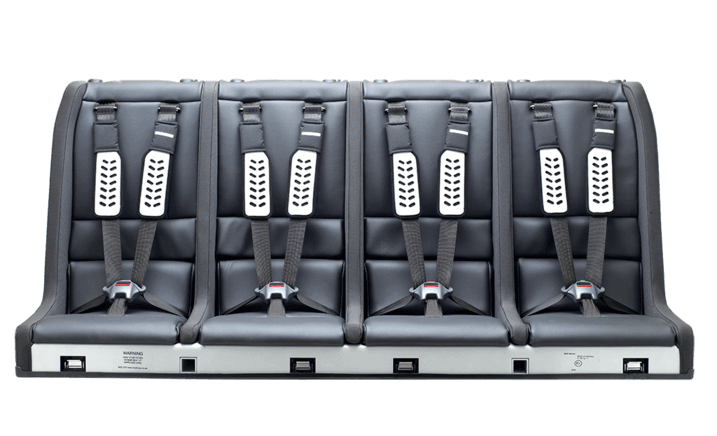 Just comfort, like aeroplane seats – First class, Business class or Economy. Even he narrowest Multimac 4-seater  has been crash test approved with 4 x 32 kg [12 yr old] dummies. The biggest practical difference is that the narrower seat will not take a MINIMAC, so that if you have a Ford Fiesta for example, you could fit a narrow 4-seater , but if you had a baby and needed a MINIMAC, you would have to fit a 3-seater , which will actually take 3 MINIMACs. No. Tests conducted to date have demonstrated that side airbags will not cause injury to children in child restraints provided they are fitted and used properly. Problems will only arise if the child is resting or sleeping against the door, so the MINIMAC and YLVA will give adequate protection for young children. If you factor in the flexibility [Adjustamac] of being able to instantly alter the seat belt height to take any of your neighbours’ children as well:- you would need a bootful of childseats and a bigger car to give the same capacity. QUALITY/SAFETY: what price safety? The Multimac/MINIMAC crash test results are second to none. The Multimac is an Integral-Child-Seat, which defines its own strength rather than being supported by the adult belt/seat. It is constructed in a special grade of Aluminium which requires 2 hours of welding per seat, and incorporates many separate energy absorbing features in addition to the legs. The upholstery is to normal Automotive/Aeroplane/Train standards, so will last well past the needs of your children. The individual 5-point harnesses incorporate instant height adjustment, and further energy absorbing chest pads. The whole assembly works whether it is carrying one 9 month old baby, or four 12 year olds, or any combination in between. Yes. 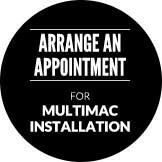 Multimac will have a very long service life, so all serviceable components [covers etc.] will be available as spare parts. Yes: it has carrying handles, and a flat base so it can be put on a level surface with the baby in it. We are developing a ‘transport system’ so it can convert into a pushchair, which will take one, two or three MINIMACS. We did. We had one in the family car and one in the Au-pair’s car for 7 years [Children 0,3,5,6, - 7,10,12,13] and continued to use it in the Au-pair’s car for further 3 years. These are both still in perfect condition, and will eventually appear in the Multimac museum….